Brunei Darussalam is richly endowed with cultural heritage steadfastly maintained until today. The setting up of the Arts and Handicraft Centre in 1975 is a living testimony as to the preservation and the proliferation of the arts and crafts of the bygone days which Brunei was renown for such as boat making, silver-smithing, bronze tooling, cloth weaving as well as mat and basket weaving. Relics and other various artistic heritage of Brunei Darussalam besides the ones mentioned above include Malay weaponry, woodcarvings, traditional games, traditional musical instruments, ‘silat’ (the traditional art of self defense) and decorative items for women. Angkor Wat, the world’s largest temple and the other temples of the Angkor Archaeological Park are Cambodia’s greatest works of art. Angkor Wat has been called the “eighth wonder of the world” and contains many sculptures, and stone carvings depicting epic Indian stories such as The Mahabharata and The Ramayana. In the Bayon, in Angkor Thom, carvings show people going about their daily lives, farming and shopping. The craft of carving continues today, along with crafts such as silver work and weaving. Indonesian crafts have various styles, patterns and designs. Most of the patterns and designs were inherited from ancestors with various cultural backgrounds. Traditional or spiritual values from many tribes are reflected in the colors, forms and typical crafts from various regions. Cloth weaving with different motifs, patterns, and colors are done all over the country. Songket and ikat weaving are done in Sumbawa, Flores, Kalimantan, South Sumatra, West Sumatra, Bali and East Timor. Indonesia is well known for its rattan baskets. Earthenware, ceramics and silverware are also part of Indonesian crafts. Other crafts include plait work of lontar leaves, bamboo and pandanus leaves into various forms such as baskets, bags, hats, mats, wallets and household articles. The most famous Lao craft is hand-woven textiles made from locally produced cotton and silk. The motifs in Lao textiles include thousand year old symbols such as Tantric diamonds providing protection from evil spirits. Animal motifs include people, birds, spirits, and mythical animals such as the royal long-nosed lion, naga snakes, and the two-headed river dragon. The best weavings are usually associated with religious occasions. In some parts of Laos priests or priestesses use a special style of red scarf in purification ceremonies. Besides textiles, other crafts include embroidery, basket making, batik, and woodcarving. Malaysia has a variety of crafts. The more popular crafts in Malaysia include batik, songket weaving, kite making, pewter making, knife making, weaving and wood carving. Songket, woven from gold and silver threads, is used for ceremonial occasions and weddings. Malaysian batik is perhaps the most well known in the world. There are four methods to batik making – tie dying, block-printed, silk-screened or simply by drawing with a free hand. Free hand and block printing are the most widely used methods of making batik designs. Designs are painted on in wax, with the cloth then being immersed in a dye bath. Kite making as a craft is widely practiced in Kelantan. Various types of kites include wau kuching (cat kite), wau merak (peacock kite), and wau bulan (moon kite). Kite-making requires tremendous skill and patience and this knowledge is usually handed down from father to son. Weaving is particularly popular in the east coast states of Kelantan and Terengganu on the Malay Peninsula. Pandan and Mengkuang leaves are woven into baskets, mats, wallets, lampshades, food covers, handbags, hats and even sandals. Malaysia is famed for its Selangor Pewter – a mixture of tin, copper and antimony, which is made into over 1000 different tableware and gift items. Other crafts include silver craft from Kelantan, renowned for its intricacy of design and superior workmanship. Silversmiths use two kinds of techniques – filigree and repousse. Items range from the functional to the purely ornamental and include fruit bowls, tea sets, ash trays, brooches and bracelets. Myanmar has a rich history in crafts. Mandalay, the ancient capital and the glory of Myanmar Kings, represents the largest repository of Myanmar crafts. The pagodas, religious monuments, and major Buddhist sculptures seen all over Myanmar are authentic examples of the rich tradition of Bagan crafts and of prior eras of craftmanship so evident throughout Myanmar’s history. Tapestry, one of Myanmar arts and crafts mainly originated in Mandalay and famous souvenir. Myanmar tapestry involves an intricate weaving of colored threads with appliqué work and lavish embellishment with gilded materials and semi precious gems to yield a picture In Myanmar, gold leaves are widely sold at the famous pagodas to gild the Buddha image or stupa with gold leaf. Sheets of gold are beaten into gossamer-thin pieces, which are cut into squares and sold in packets to devotees to use for gilding images or even complete stupas. Since Myanmar produces good quality teak wood, lavish embellishment with wood carvings can be seen at the religious buildings and hotels. Wood carving furniture and other decorative materials are widely used in Myanmar. In Mandalay, ancient brass moulding factories produce innumerable Buddha images and other decorated objects. They are still using primitive technique very skillfully. Weaving is one of the important crafts of Philippines. Fibers from piña, piña seda, banana seda, banana or abaca leaves are widely used in weaving clothes. Apart from cloths, various other craft items are made from these leaves. Abaca is used in making braided bowls and bins. Buri is used for making hats, boxes and other novelty items. Caragumoy is used traditionally for mat-making, hats, bags and baskets. Pandan-Dagat is made into hats and mats and ahs evolved to be a favored material for cushions and canisters. Coconut is probably the most utilized palm in the Philippines. The cocomidrib is used primarily in the handicraft industry as a material for coarse brooms (tingting) and baskets. It can be dyed easily and formed into interesting products such as canisters and tabletop accessories (ceramic liners, bowls, etc) in combination with other materials. In addition, bamboo and rattan are widely used in making furniture items. Thailand has a uniquely long-standing tradition of arts and crafts. Unlike most of its neighbours, it has never been occupied by a foreign power or engaged in wars of conquest. 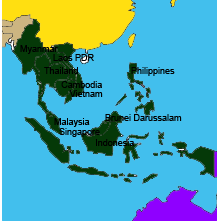 Thailand has enjoyed a relatively peaceful development since ancient times. Patronized by the court and the temples, the designs and craftsmanship of Thai artisans has flourished. Thailand’s handicrafts are delicate in workmanship and intricate in design, giving people in other countries a glimpse of what Thai culture is all about. Thai craftspeople are adroit in making beautiful handmade crafts, gifts and decorative items for the home and garden. Thai textiles are probably the best-known example of its indigenous handicrafts. Other craft items include silverware, laquerware, jewelry, earthenware, baskets furniture and wood carving. Wooden pieces can be crafted into elegant floral displays, stunning carvings or graceful and unusual furniture. Vietnam is a land of handicrafts, so long established and so varied that the names of many villages, hamlets and city streets have become synonymous over the centuries with particular occupations or production processes. Wood carving gave birth as a matter of course to the art of lacquer-work, then to other crafts such as the production of red paint from mineral sands. The skill of the gold and silver smiths further embellished and increased the value of each lacquered item. The Vietnamese people have traditionally coated their utensils with lacquer in order to enhance their durability and beauty. Lacquered objects are to be found in profusion in any house, pagoda, temple, palace or shrine, and the hundreds of thousands of items that survive to this day attest to the important position held by this particular craft in the nation’s cultural history. Other crafts include embroidery, weaving, pottery making, and wickerwork. Some of the products of wickerwork include baskets for winnowing, bags, mats, blinds, lattices, chopsticks and even building materials. In Vietnam, wickerwork incorporates a unique blend of the practical and aesthetic.